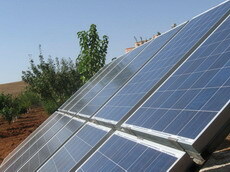 Project Introduction: Solartech solar submersible pump were provided as key components in the solar pumping system for agricultural irrigation. Solution: The system utilizes 2.1KW PV panel to power a 1.5KW AC submersible pump with a Solartech 2.2KW solar pump inverter for control and conversion. 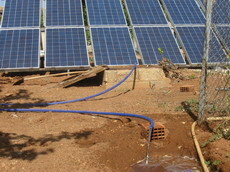 The solar pump draws water from 117meters underground. Economy Benefit: During 25 year using life of our system it will save coal 36 tons; and reduce carbon emission 15.8 tons, sulfur dioxide0.72 tons, dust 0.54 tons and lime ash 9.36 tons.